We began 2018 by setting an intention to celebrate the “wabi-sabi” nature of life - celebrating life as it unfolds, recognizing that life is perfectly imperfect. As we look forward to 2019, we invite you to join us in offering up an intention to listen + speak mindfully. What does it mean to listen mindfully? acknowledging the emotional reality of the speaker. 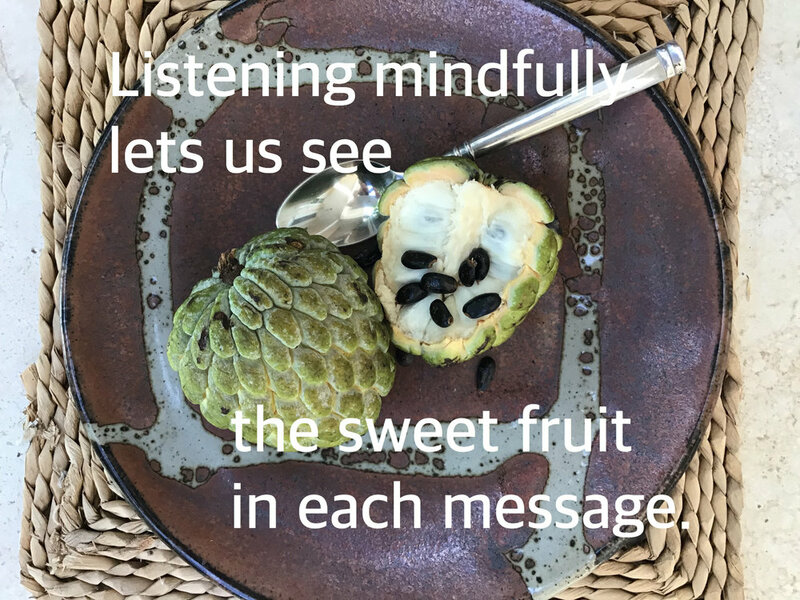 Mindful listening can also take place when we listen to ourselves, bringing awareness to how we speak to ourselves - would we speak to a loved one in this way? Noticing what needs may lie unexpressed within us; listening to the stories we tell ourselves so that we can decide which to believe and which to gently set aside; listening to detect when we are letting narrative or story slip in between us and our actual lived experience; listening to our bodies with kindness as they send us messages about our emotional states or areas that need attention, or are at peace. We have one session left this year: Wednesday December 26th at 12PM at New Canaan Library. May all beings everywhere, without exception, feel heard.